Nutrient recycling of N, P, and K (e.g., up to 1 pound N per 1,000 feet2 per year) and other essential nutrients. Reduced need for supplemental nutrients. Elimination of the need to remove clippings to other areas of the facility or an off-site disposal area. In areas where clippings cannot be returned (such as greens), they can be blown, dragged, or otherwise moved away, though should not end up in or near stormwater treatment structures or wetlands. Alternately, clippings can be collected and composted. Composted clippings can be used as soil amendment or fertile topdressing during establishment of new tee, fairway, or rough areas. Plant growth regulators (PGRs) can also be used to reduce clipping production. Return clippings to canopy whenever possible to recycle nutrients and reduce the need for fertilizer inputs. 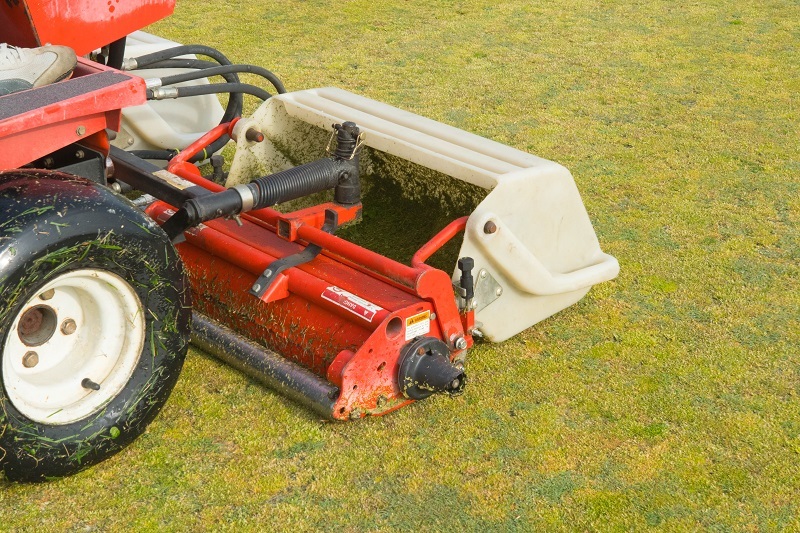 Remove clippings when the amount is so large that it could smother the underlying grass or on golf greens where clippings might affect ball roll. Dispose of collected clippings properly; options include composting or dispersing clippings evenly in natural areas. When clippings are not returned, they should be collected and disposed of properly, such as by composting or dispersing clippings evenly in natural areas. Photo credit: Joseph Roberts.